The business jet industry is expected to experience strong growth in the short to medium term, supported by several new airplane models coming to market and an improved used aircraft environment, according to Honeywell’s 27th annual Global Business Aviation Outlook. Released, the Global Business Aviation Outlook forecasts up to 7,700 new business jet deliveries worth $251 billion from 2019 to 2028, up 1 to 2 percentage points from the 2017 10-year forecast. Operators plan to make new jet purchases equivalent to about 20 percent of their fleets over the next five years as replacements or additions to their current fleet, an increase of 1 percentage point compared with the 2017 survey results. Of the total purchase plans for new business jets, 14 percent are expected to occur by the end of 2019, while 16 percent and 24 percent are scheduled for 2020 and 2021, respectively. Operators continue to focus on larger-cabin aircraft classes, ranging from the Super Mid-size through Ultra-Long range, which are expected to account for more than 87 percent of all expenditures of new business jets in the next five years. The longer-range forecast through 2028 projects a 3 to 4 percent average annual growth rate as new models, improved economic performance, and anticipated favorable exchange rates for international customers will contribute to industry growth. Purchase plans are higher in North America this year than last, and increased significantly in Europe, with slow economic growth and geopolitics affecting plans in Latin America, Middle East and Asia Pacific. North America – Compared with last year, new aircraft acquisition plans in North America are slightly higher. An estimated 61 percent of projected global demand comes will come from North American operators over the next five years. New jet purchase plan levels increased 1 point in North America, the industry’s largest market with 65 percent of the installed base. About 36 percent of operators responding to the survey plan to schedule their new purchases within the first two years of the five-year horizon. This is 3 percentage points lower than last year’s survey, but much higher than the worldwide average of 30 percent. Europe – Despite operators still contending with slow economic growth and the uncertain effects of Brexit, new jet purchase plans increased significantly in this year’s survey. Europe’s purchase expectations increased this year to close to 33 percent, an increase of 14 percentage points compared with last year’s results. Based on the best survey results in the past five years, Europe’s share of estimated global five-year demand has increased to 16 percent in the 2018 survey. A comparison of the planned timing for European purchases indicates a cautious approach to timing the replacement or expansion of the fleets with new acquisitions. Only 26 percent of new jet purchases are expected in the first two years of the survey, while more than 45 percent are scheduled for 2022 and beyond. Latin America – Purchase plans are down 7 percentage points when compared with last year. Higher purchase plans in Brazil are offset by significantly lower purchase plans in Mexico. 22 percent of the sample fleet in Latin America is expected to be replaced or added to with new jet purchases over the next five years. Despite higher purchase plans from operators in Brazil, also tracked as a BRIC country, NAFTA discussions resulted in significantly lower purchase plans from Mexican operators in this year’s results compared with last year. About 24 percent of this region’s projected purchases are planned between 2018 and 2020, lower than the worldwide average of 30 percent. Based on the current purchase plan levels, Latin America would represent 12 percent of total projected demand over the next five years. Asia Pacific – Despite geopolitics and regional tensions, purchase plans are stable in the region, down only 1 percentage point from last year. Operators in Asia Pacific report new jet acquisition plans for 12 percent of their fleet over the next five years. Based on the expressed level of purchase plans, Asia Pacific would represent close to a 7 percent share of global new jet demand over the next five years. Only 15 percent of Asian respondents plan to schedule their new purchases within the first two years of the five-year horizon. Middle East and Africa – Lower purchase plans were reported, impacted by political tensions and ongoing conflict in the region. The share of projected five-year global demand attributed to the Middle East and Africa is 4 percent this year, in line with the historical range of 4 to 7 percent. 14 percent of respondents said they will replace or add to their fleet with a new jet purchase, down from 18 percent last year. Only about 19 percent of operators responding to the survey plan to schedule their new purchase within the first two years of the five-year horizon. Brazil, Russia, India, China (BRIC) – A significant increase in Brazilian purchase plans compared with last year drove higher BRIC results. BRIC purchase plans are up this year following a decline in 2017, reaching just over 25 percent. This rate is 5 percentage points higher than the world purchase plan rate. Brazil recorded twice as many mentions for new aircraft in the survey compared with last year’s results. The combined BRIC countries’ near-term demand profile has shifted somewhat later in the forecast period this year, with only 22 percent of intended new jet purchases scheduled for the next two years. 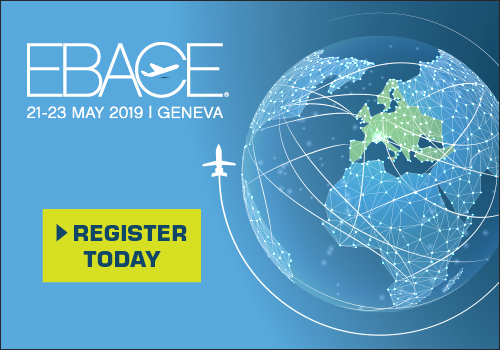 The pace of flight activity in the past year has increased, with survey respondents in all regions of the world except Asia reporting higher utilization in 2018 compared with 2017. Average asking prices have increased slightly in August compared with previous years with light jets higher, medium jets stable and heavy jets lower. There has been a 13 percent improvement year over year in overall used aircraft inventory levels. The total number of recent model jets (less than 10 years old) listed for resale is down 30 percent year over year and is now just slightly higher than 5 percent of the installed base. This is well below historical average of about 8 percent and very positive for new business jet sales. A decline in young used aircraft inventories has been led by North America with only 4 percent of the installed base for sale. Asia has the highest 0- to 10-year used aircraft for sale at slightly more than 7 percent of installed base for sale. In proportion to the level of overall listings, however, the share of recent model jets for sale is still more than 20 percent of total listings in comparison with pre-recession levels of 15 to 20 percent. Survey respondents decreased their used jet acquisition plans by about 1 percentage point, equating to 24 percent of their fleets in the next five years. All regions’ used jet purchase plans were higher or stable, but slightly lower in North America. This annual outlook reflects topical operator concerns, but also identifies longer-cycle trends that Honeywell uses in its own product decision process. The survey has helped identify opportunities for investments in flight-efficiency upgrades, expanded propulsion offerings, innovative safety products, services, upgrades, and enhanced aircraft connectivity offerings. The survey also contributes to Honeywell’s business pursuit strategy and helps position Honeywell consistently on high-value platforms in growth sectors. Honeywell’s forecast methodology is based on multiple sources including, but not limited to, macroeconomic analyses, original equipment manufacturers’ production and development plans shared with the company, and expert deliberations from aerospace industry leaders. Honeywell also utilizes information gathered from interviews conducted during the forecasting cycle with over 1,500 nonfractional business jet operators worldwide. The survey sample is representative of the entire industry in terms of geography, operation and fleet composition. This comprehensive approach provides Honeywell with unique insights into operator sentiments, preferences and concerns, and provides considerable insight into product development needs and opportunities.